A canal that never was but still may be! Proposed alternate to the Panama Canal through Nicaragua. Panoramic View of the Nicaragua Canal. 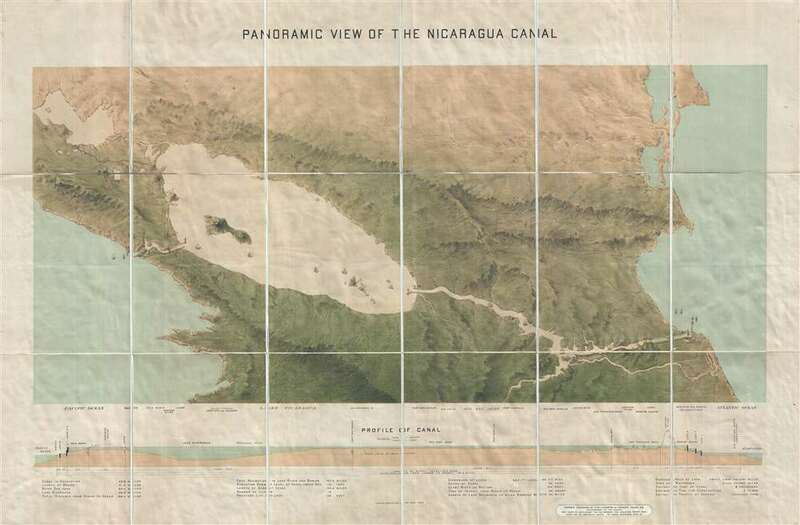 A rare and fascinating c. 1899 chromolithograph view of the proposed Nicaragua Canal by Julius Bien. The development of an intercontinental canal connecting the Caribbean (and therefore the Atlantic) with the Pacific in Central America was one of the major engineering goals of the late 19th and early 20th centuries. While the French were focusing on the Panama Canal, Americans were looking to Nicaragua. As early as 1899, United States Navy Bureau of Navigation Captain A. S. Crownshield visited the region and published a defense of the Nicaragua Route as the only reasonable intercontinental. It was perhaps general interest spurred by Crownshild's article that inspired Bien to create this view. Beginning on the Caribbean Sea not far from the modern-day Nicaragua / Costa Rica border, the route would proceed inland through a series of locks and an excavated channel to the San Juan River, from which it would proceed to Lake Nicaragua (Cocibolca) near San Carlos. Lake Nicaragua, is a massive inland lake covering nearly half of the width of the isthmus. From Lake Nicaragua, another excavated channel and more locks would lower ships some 45 feet toe San Juan del Sur and the Pacific. The presentation of the map makes the route seem exceptionally practical and vastly easier to construct than competing efforts further south in Panama. Nonetheless, a number of factors worked against the Nicaragua Route. The Panama Canal was already under construction and, despite its own problems, attracted a great deal of investment. Moreover, lobbyists in the United States warned of Nicaragua's earthquake prone landscape, heavy rainfall, and political instability. Just as investors seemed to be lining up, in spring of 1902, the volcano Momotombo, conveniently located just beyond the scope of this view, erupted, leading investors to turn their attentions to the more geologically stable Panama. Nonetheless, efforts continue to this day to complete a Nicaragua Canal and construction is currently underway by the Hong Kong Nicaragua Canal Development Investment Company (HKND Group). Cartographically Bien's view extends from Lago Xolotlán to the modern-day Nicaragua / Costa Rica border, and from the Pacific Ocean to the Caribbean Sea. It includes all of Lake Nicaragua, as Lago Xolotlán and the capital of Managua. Cities are shows, but few are named save along the bottom of the amp. Also along the bottom of the map there is an elevation profile of the canal, as well as additional statistics, intended to illustrate the practicality of the route. BThis view was printed by Julius Bien of New York. The map bears a pastedown stamp for Edward Stanford LTD, Charing Cross, London and was likely sold at Stanford's shop. OCLC 15864159. Library of Congress, G4852.N55 187- .P3.